Surrey Fire & Safety Ltd. takes pride in delivering quality work and service and carries a number of industry accreditations and quality certificates. We are committed to continuously improving our business and providing ongoing training to our team, so they are up to date with the latest standards and procedures. We are accredited with BS EN ISO 9001:2008, the international standard for Quality Management Systems (QMS). This means that we have the tools and skill-sets to effectively manage our business to meet your requirements. Our focus is on building a constantly improving, streamlined business that lets us keep our prices competitive, and makes us easy to do business with. BAFE is the independent third party registration body for the fire protection industry. Its badge is a byword for quality work – all BAFE schemes are approved to ISO 9001 or equivalent. All of our extinguisher engineers are members of BAFE scheme SP101, also known as the Portable Extinguisher Maintenance scheme. 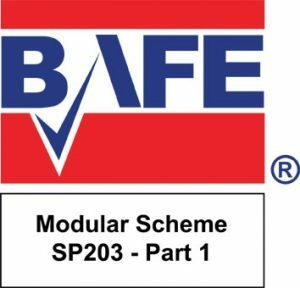 We are currently processing our membership for BAFE scheme SP203 – fire alarms – and will shortly be accredited with parts 1, 2, 3 and 4. This means that our fire alarm engineers, whilst they already work to British Standards, will be formally accredited in System Design, Installation, Commissioning and Maintenance. We are members of the Fire Industry Association (FIA), the largest fire safety trade organisation in the UK. The FIA is a well-respected, not-for-profit organisation. Its objective is to promote, improve and perfect fire protection methods, devices, services and apparatus – a goal which is close to our hearts.